The equity markets have been anything but kind to investors long stocks. Nearly all the broad market equity indices are in negative territory for the year. The S&P 500 Index: -6.2%, Dow Jones Industrial Average: -8.5%, S&P MidCap Index: -4.4% and the S&P SmallCap Index: -4.6%. Simply reviewing social media comments from investors, one could be lead to believe the market has no where to go but down. Admittedly, the market trend and direction of least resistance does seem to favor the bears; however, some technical data is beginning to potentially signal a turn to a more bullish posture. In August when the S&P 500 Index dropped to 1,867 the CBOE Equity Put/Call Ratio spiked to over 1.0 indicating a potentially oversold market. The market did recover from that August low, but recently has resumed its downtrend. Sometimes a better indicator is to look at the 21-day moving average of the put/call ratio. As can be seen in the below chart, the moving average of this ratio has begun to trend lower after reaching a high of .79 on 9/18/2015. Declines in this ratio are generally associated with a market that trends higher on a go forward basis. So the Fed did not raise rates yesterday. To some this seemed to be a surprise; however, as we noted in our post a few days prior to the announcement we believed global economic factors could play a part in the Fed's rate decision. In fact, Janet Yellen cited issues in markets outside the U.S. as one reason for not moving on rates. Additionally, inflation in the U.S. remains well below the Fed's 2% target rate. Possibly the biggest surprise out of the meeting was the fact one Fed member believes the Fed needs to move to a negative interest rate position. In our view the Fed has waited too long to move interest rates higher. 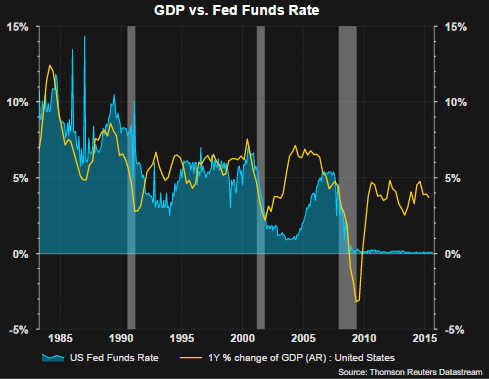 The result is the Fed is now in a position where their next move, not necessarily in the next six months, would be lowering rates given where both the U.S. and global economies are in their respective business cycles. The comment on negative interest rates by one Fed member was likely not made without the blessing of Yellen in advance of the meeting. Because the Fed may believe they missed the opportunity to raise rates, the negative interest rate comment is a way to telegraph to the market they have a tool to stimulate if necessary in spite of the current zero interest rate level. Probably the most discussed potential Fed decision on rates is the one forthcoming on Thursday. When it is all said and done, the rate increase in and of itself is really not the issue investors should factor into their investment decision. As we have pointed out in prior posts, higher rates have mostly been a positive for stock returns. A primary issue is the state of the economy, both in the U.S. and globally and the tightening impact of a rate increase. Compounding the confusion around the impending rate increase or no increase, is the uncharted territory created by all of the Fed's quantitative easing activities implemented since the end of the financial crisis. In reality, a quarter percent (25 basis points) increase from a near zero rate is likely to have no material impact on many fronts. The pace at which the tightening is pursued though is an issue. The other is the fact the Fed states rate decisions will be data dependent going forward. Therein lies the market's confusion. The Fed has a 2% inflation target which has yet to be reached and it is debatable if the economy is near full employment given the sharp decline in the participation rate. A case can be made that the last QE program was not needed and a tightening cycle should have been started over a year ago. In reality, at the end of QE3 the Fed made clear it would retain bonds purchased under the QE programs, would also reinvest bond proceeds and rates would remain near zero for a "considerable time." All of these are easing activities. This brings us to the decision on Thursday and the data that outlines economic activity. One aspect of the market's recovery since the financial crisis has been the strength of the consumer discretionary sector. 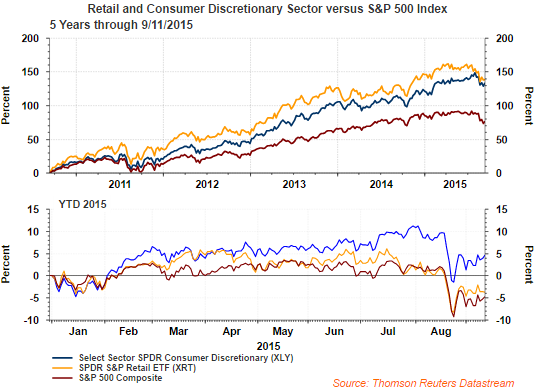 Within the sector itself the retail industry group has outperformed both the S&P 500 Index and the overall discretionary sector itself. This strength could not occur over this long of a period without an improving consumer. The second frame in the below chart, however, shows the retail ETF has begun to underperform the discretionary sector this year and is a potential sign of a weakening consumer. This weakness in the retail sector is further confirmed by the very poor University of Michigan Consumer Sentiment Index preliminary results reported on Friday. The sentiment reading of 85.7 was over six points lower than the August reading of 91.9 and below the low end estimate of 86.5. Econoday's summary of this report indicates this may put a potential Fed rate hike on hold later this month. "Just when you think you've gotten through the week, consumer sentiment dives and, perhaps, tips the balance against a rate hike. The mid-month September flash for the consumer sentiment index is down more than 6 points to 85.7 which is below Econoday's low-end forecast. The index is now at its lowest point since September last year. Weakness is centered in the expectations component which is down more than 7 points to 76.4, also the lowest reading since last September. Weakness in this component points to a downgrade for the outlook on jobs and income. The current conditions component also fell, down nearly 5 points to 100.3 for its weakest reading since October. Weakness here points to weakness for September consumer spending. Inflation readings are quiet but did tick 1 tenth higher for both the 1-year outlook, at 2.9 percent, and the 5-year, at 2.8 percent. New York Fed President William Dudley himself has said he is focused on this report as an early indication of how U.S. consumers are responding to Chinese-based market turbulence. These results offer a rallying cry for the doves at next week's FOMC meeting." The above chart also includes retail and business inventory to sales ratios. The business inventory to sales ratio (blue line) is far above the pre-2008 recession level and near the recession level prior to 2001. 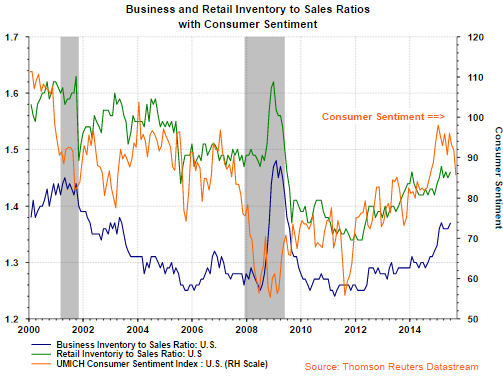 Also, the retail I/S ratio is near the levels reported in 2008. As noted above, the expectations and current conditions components of the sentiment report suggest weakness in the months ahead. Consumer sentiment is not the only driving force of economic growth; however, the consumer does account for 70% of economic activity. The poor sentiment report does provide some Fed members with data that suggests a Fed hike should not occur this month. The Fed is in a corner for sure as we have noted in several recent blog posts. They seem to have missed an opportunity to raise rates a year or more ago. We will see if they raise them now in spite of the continued slow growth economy and a potentially weakening one. As is typically the case when the market is attempting to form a bottom, positive technical signs can be difficult to uncover in the midst of the bearish chatter. This time seems to be no different and the key is whether potentially positive technicals can win out in the face of some weakening fundamental factors. The below chart shows the daily price action for the S&P 500 Index along with several technical indicators. Although the MACD indicator line has not crossed the signal line, the MACD line (green) is nearing that cross. Additionally, the stochastic oscillator made new highs in August at a time the market was selling off. 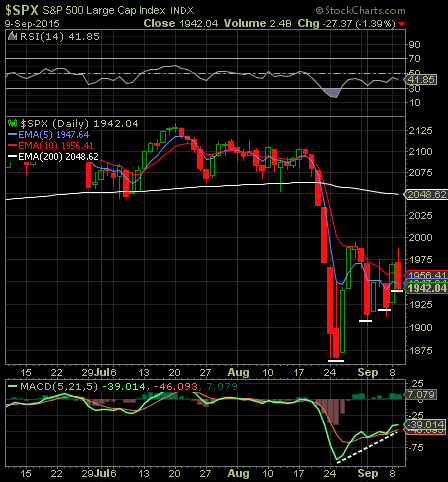 Shortly thereafter the stochastic oscillator fell below 20 on the gap lower low. Subsequent to this oversold indication, the market moved higher. Of interest in the below chart is the symmetrical pennant pattern that has formed with the market's higher lows and lower highs. A break above resistance will be important for further market upside. Sometimes changing the exponential moving average settings for the stochastic oscillator can provide a clearer picture of the action in the market. The below chart uses a (5,21,5) setup. As can be seen below, this set up also shows strengthening upside momentum. Investor sentiment measures are at extreme bearish levels as well. 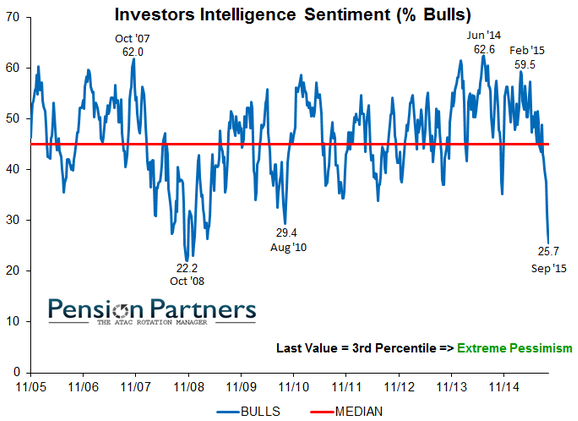 Yesterday, Pension Partners noted the Investors Intelligence Sentiment of the percentage of bulls was at its lowest level since the October 2008 reading of 22.2%. 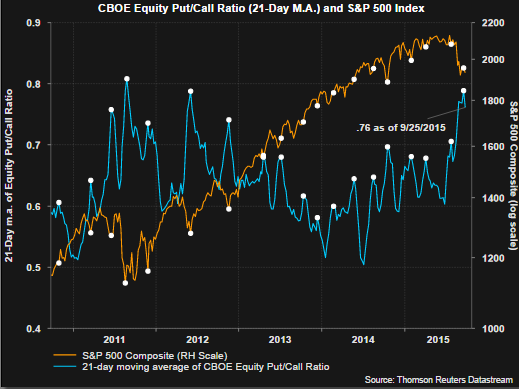 Lastly, the 21-day moving average of the equity put/call ratio is at its highest level since late 2011. 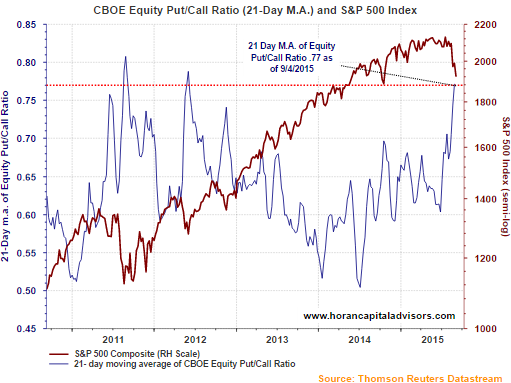 The equity put/call ratio is also indicating overly bearish sentiment and at this level the market has a history of moving higher. In short, the market correction seems to be attempting to form a bottom. 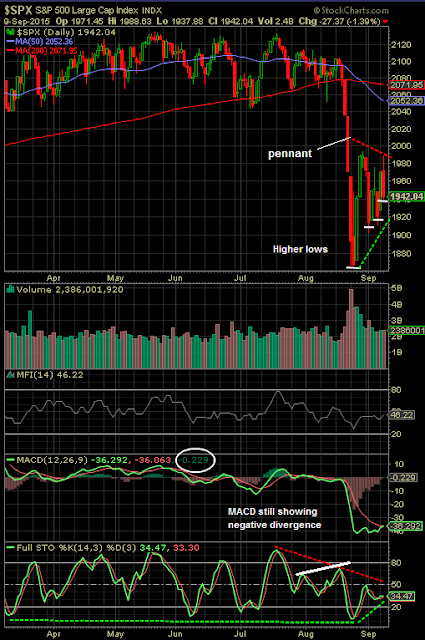 Of particular interest will be watching how the pennant pattern is resolved that is noted in the first chart above. A break above resistance would be an important market inflection point. With the increased influence of algorithmic trading, short term trading within the pennant is a high probability. And the market's uncertainty around whether the Fed raises rates or not this month has many investors on the sidelines until this event is resolved. In the end, some positive technical setups are forming in the face of this uncertainty that could enable the market to move higher into year end. Market timing, i. e., when attempting to trade into our out of the market, is a difficult strategy for nearly all investors. A Barron's article written in October of last year, The Timeless Allure of Stock-Market Timers, highlighted a few strategists' ill-timed calls and their confusion on why it did not work. The worst part of market timing is the fact the timing of getting out tends to occur near market bottoms and then getting back in the market near market tops. Making ill-conceived market moves can reduce the growth of one's investments substantially. 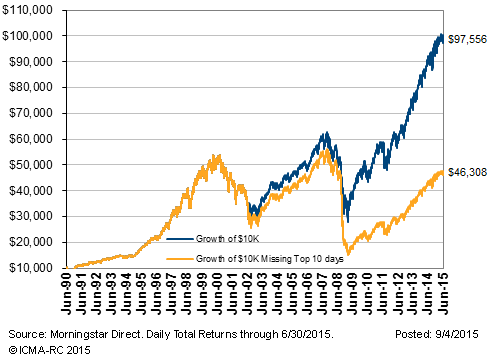 The below chart graphs the growth of the S&P 500 Index from 1990 through June 30, 2015. The blue line displays the growth of $10,000 that remains fully invested in the S&P 500 Index over the entire time period. The yellow line shows the same growth, but excludes the top 10 return days over the 25 year period (6,300 trading days.) By missing the top 10 return days over the 25 year period, the end period value grows to only half the value of the blue line that represents remaining fully invested. Given the market's recent pullback the calls for getting out of stocks has picked up momentum. Until this most recent pullback, the S&P 500 Index had gone over 1,300 trading days without a 10+% correction. This extended run without a 10+% correction can be seen in the below chart. For an investor they should not get caught up in the market timing conundrum. These sell decisions often occur near equity market bottoms. Alternatively, an investor should stick with their asset allocation plan that incorporates their time horizon and risk tolerance. If the recent market pullback is jeopardizing one's retirement as a consequence of the recent downward move in equities, they should reevaluate what an appropriate asset allocation should be. The investor's asset allocation preferences should incorporate the time horizon for various buckets of assets. Shorter term investments should not be invested in equities if accessing these funds will occur over the next several years. Timing the market may sound appealing, especially after a pullback like we are experiencing at the moment. Reducing equity exposure when the market has become increasingly volatile will certainly relieve some anxious feelings. If near term access to investments necessitates reducing equity at the moment, be sure that is the case and equity exposure is not being reduced in an effort to simply time the market. The increased market volatility experienced over the last few months is certainly more typical of equity movements and is likely to continue in the near term. The upcoming two day Federal Reserve meeting that concludes September 17th seems to have investors on edge. The million dollar questions is whether the Fed will raise rates or not. If one is a stock investor, they should hope the Fed raises rates and puts this extended anticipation to rest. Another reason investors may want to see the Fed raise rates is due to the positive impact a rate increase has on equity prices. As we noted in a post last month, Anticipating The Rate Hike, initial Fed rate increases tend to not have a negative impact on equity prices. Further evidence can be seen in the below chart. The red dots on the S&P 500 Index chart line denote the first rate hike in a Fed tightening cycle. 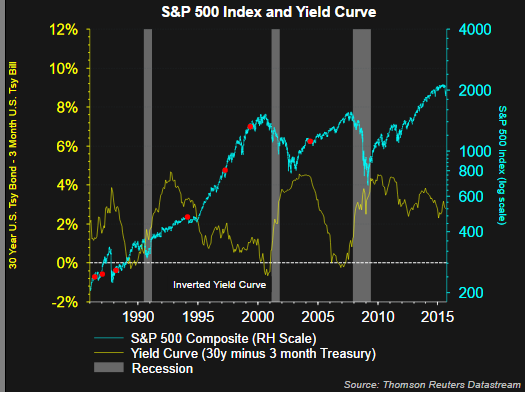 The yellow line represents the yield curve (30 yr treasury minus 3 month treasury bill) and one can see why investors focus on equity performance when the yield curve inverts. As the red dots clearly show, the onset of a tightening cycle isn't necessarily a precursor to poor equity market performance. In our earlier article link above, we provide a magnified look at equity market performance around this initial rate hike period. Equities do tend to exhibit weakness initially; however, the weakness tends to be short lived. S&P Dow Jones Indices recently released a report, What Rising Rates Will Not Do, that also examined equity returns in rising interest rate environments. The below chart included in the report shows the S&P 500 Index return during rising rate periods. The shaded area represents rising 10 year yields and clearly a rising 10-year treasury yield has not been a negative for stock returns. "Furthermore, between January 1991 and June 2015, the average monthly return for the S&P 500 was 0.88%. Paradoxically, in the four periods of rising rates, the average monthly return was 1.26%, compared with an average monthly return of 0.73% for the periods of declining rates. 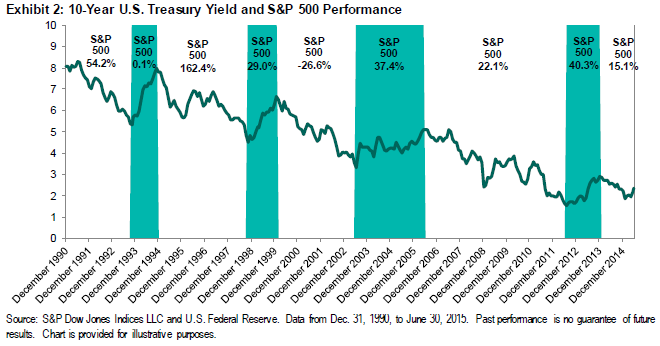 Rising rates have clearly not been bad for stocks over the past two decades (emphasis added.)" For more insight into equity returns during these tightening cycles, our article a few years back, Rising Interest Rates Can Be Good For Stocks, provides a table outlining equity returns over various cycles going back to 1973. It seems the Fed has missed an opportunity to increase rates as far back as a year ago; however, a lift off in September doesn't mean stocks are a poor investment over a complete tightening rate cycle. Certainly, stocks are likely to experience more volatility around this initial lift off period, but can move higher after the beginning of the rate increase cycle. 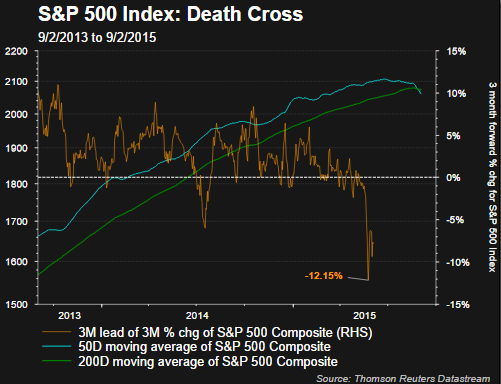 Death Cross More Of A Buy Signal? With the recent weakness in the equity markets, many stocks' and stock indices' chart patterns have traced out a death cross pattern in their moving averages. The Death Cross is a technical indication when the 50 day moving average crosses the 200 day moving average from above. As Michael Batnick of The Irrelevant Investor blog noted a few days ago, very few technical analyst use the death cross pattern in their chart analysis. However, much has been written about the death cross recently and a closer look at the pattern reveals stocks/indexes tend to be closer to rebounding subsequent to the death cross trigger than experience further weakness. The chart below highlights the most recent occurrence of the death cross for the S&P 500 Index other than the one just occurring late last month.The below chart covers the calendar years 2010 and 2011. The orange line on the chart is the rolling three month return for the S&P 500 Index. 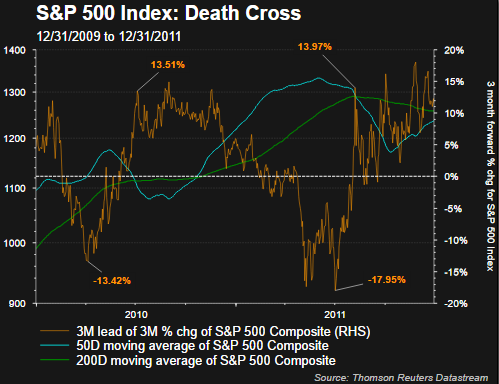 This line has been shifted to the left by three months and shows the forward three month return from near the date the index average triggered the death cross pattern. For example, in August 2011 when the index triggered the death cross, the subsequent three month return for the S&P 500 Index was about 13.97%. Importantly, the worst of a market's decline tended to occur and end near the point the moving averages triggered the death cross. 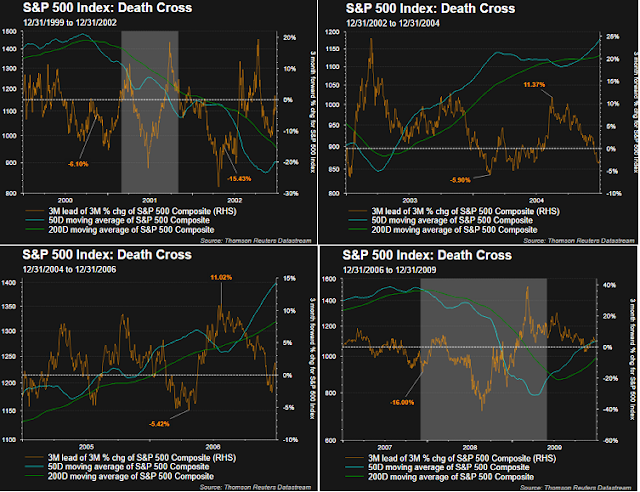 The following four charts show death cross triggers back to 1999. The times in which the market continued to weaken once the death cross pattern was triggered was closer to or during recessionary economic periods. Finally, below is the chart for the late August death cross for the S&P 500 Index. Is a subsequent rebound in the index more likely? Moving averages are lagging indicators by the nature of their construction. In other words, the patterns traced out in the moving averages follow the price of an index or stock. When the death cross is triggered then, it is likely most of the price decline in the index or stock has already occurred. Again, the exception is around recessionary economic periods and our current view at HORAN Capital Advisors is the U.S. economy continues its slow growth pace and does not tip into recession.